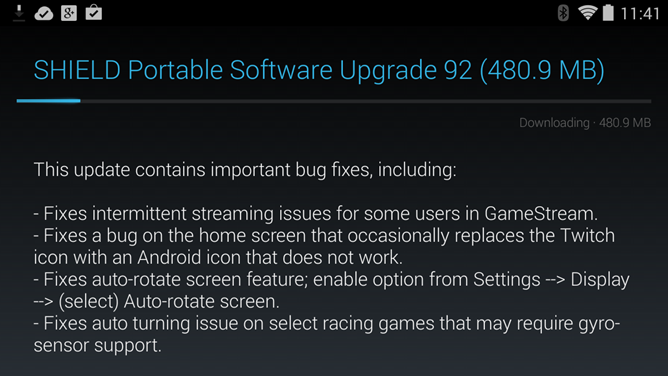 One of the nicest things about NVIDIA's various bits of Android gaming hardware is that they get updated early and often. The SHIELD Portable is already running on the latest version of Android, but a new update (dated Tuesday, but apparently going out a little late) has fixed a few small issues with GameStream and other services. If you have a SHIELD, check your Settings menu - the 480.9MB update should be available as soon as you check it manually. The first bug is with NVIDIA's GameStream service, itself prone to various connection issues. The company didn't say exactly what was broken, or indeed, exactly how they fixed it. The Twitch app was apparently giving them some trouble as well, thanks to an odd bug that caused it to show an inoperable shortcut icon. The other fixes are for broader problems: the auto-rotate feature (which gets apps to automatically run in landscape mode on the SHIELD's fixed horizontal screen) should now be working, and a gyroscope bug affecting tilt controls in racers and presumably other games was squashed. That's all there is to this update, though if you haven't played with your SHIELD in a while, you might have to install last month's update as well. Get after it.